The hero Bellerophon, riding on the back of the winged horse Pegasus, spears the Chimera. The beast is depicted a sa lion with a serpent for a tail and a goat's head rising from the middle of its back. 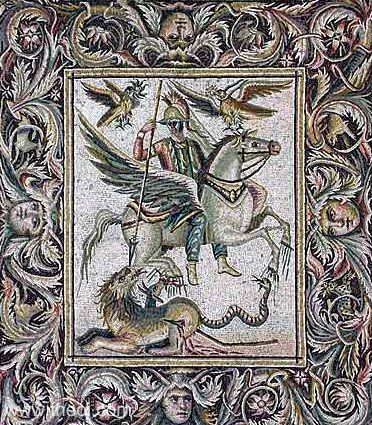 The hero is dressed in a Persian body-suit and the hooves of his flying steed drip with water--in myth, Pegasus' hoof-prints formed springs.